Sundy Goodnight | His Kids Too! In October I had the privilege of joining His Kids Too! for sixteen days of life-changing ministry. 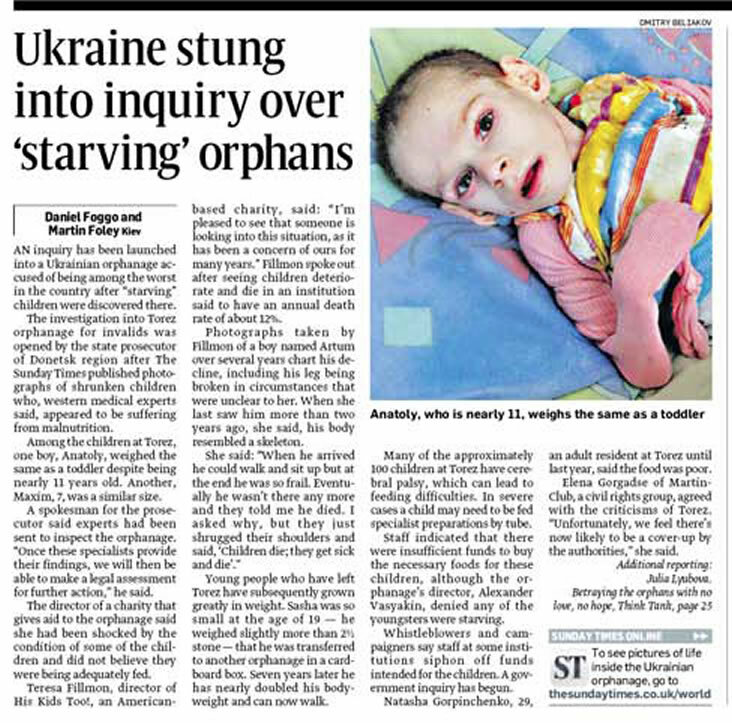 From the moment the team touched Ukrainian soil we were on the go, working hard to help the hurting and needy orphans. Though we distributed many boxes of clothing, toys, diapers, bananas etc., we simply didn’t have enough to go around. The need is staggering, the resources few and the children many. We took aid into facilities with no indoor plumbing, limited food, no meat, no playground equipment or toys. I saw handicapped children lying in their own excrement, their bones protruding. I experienced the eeriness of a roomful of silent, diaperless babies, babies who no longer cry because it does them no good—there aren’t enough workers to hold and love them. Yes, the physical needs are great, and His Kids Too! did all we could to meet those needs. But after visiting 14 orphanages, teen prostitutes, HIV infected babies, starving and sick children, I was profoundly struck by one thing that each child craved above all. That thing was love. The first day I met Marina, her shorn hair, tiny frame and dirty, three-sizes-too-big sweatshirt caught my attention. She sat near me in our Sunday afternoon Bible class, her hungry eyes locked on me seeking my attention. I motioned for her to come and sit next to me. She quickly positioned herself at my side and spent the next hour stroking my hair and hand, giggling at every funny face I made at her, and hugging me repeatedly–she hugged me so many times I thought her hand prints would be permanently embedded into my waist. Several days later we went back to this same orphanage. I didn’t have to look for Marina, she found me. She came running as she saw our taxi pull up in front of the orphanage and attached to me like gum on the bottom of a shoe. She drew from me every ounce of love and attention I could give. Yes, Marina needed new clothing and it was a pleasure to outfit her in a new pair of pants and a shirt. Yet, what Marina needed just as desperately could not be bought at a market or dropped in the mail… what Marina longed for most of all was love. Nine month old Sasha’s big brown eyes and pink sweater made me think he was a girl. I walked over to him, and immediately my heart filled up with overwhelming compassion. How could someone leave this beautiful baby? What situation surrounded the mother’s choice to abandon him at the hospital, to leave an innocent, helpless child at the mercy of strangers? The Bible tells us that love compels, so perhaps I experienced a smidgen of God’s love for Sasha because I felt compelled to make a difference in the life of this beautiful little boy. At the same time I felt somewhat helpless, wondering what I could do in the brief time I would spend with him. I silently began to pray, asking God to bring Sasha a forever family who would love him, nurture him and bring him up in the truth of God. I realized in that moment that what I had to give was as important as diapers and a replacement for his pink sweater, (although he needed those). I could give Sasha the love of Christ flowing through me. Sundy, with Sasha, who captured her heart! God has given each of us that know Him an eternal gift, and He has asked us to give that gift away. It is a gift that cuts through every language barrier. It can reach and heal every hopeless and lonely heart. It can compel those who have plenty to share with those who don’t. It is the gift of God’s love. Love comes in many forms, but its source is always Christ. I realized that as a Christian, I have a responsibility, a commandment even, to take care of the orphans of the world to the best of my ability. By offering love through financial resources, clothing, time, personal involvement, or prayer, you and I can make a difference. I know that my heart has been eternally changed by the heart-breaking faces of each child I encountered. This two week mission has opened my eyes to a very different world than I’m accustomed to–a world of desperate need, a world of hopelessness and despair, a world where children have no dreams of the future. And over and over again, I’m struck with the realization that all this stunning need has its origin and its solution in one powerful ingredient. That ingredient is love.